Toronto Real Estate Blog - GTA News : Beautiful 2 Story Detached On Britannia !! Great Home + Large Yard! 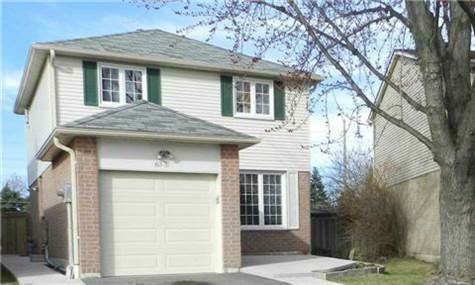 • 3 bath, 3 bdrm 2 story - MLS® $549,000 - Meaddowvale Gem! Winston Churchill/Britannia, Mississauga - Sought After Meadowvale Neighbourhood! Move in Ready Condition Home With Thousands Spent In Upgrades - You Must Simply Bring Your Things! Detached House With 3 Bright & Spacious Bedrooms, 3 Baths And Large Backyard! Finished Basement With Side Entrance. A Lot Of Upgrades And Renovations; New Stunning Hardwood Floor Throughout Main And Second Floor, New Stairs and Much More! Open Concept Living And Dining Rooms With A Walkout To Deck and Charming Bay Window! Great Flow For Entertaining! New Kitchen With Granite Counters and Plenty of Cabinetry Space! Great Sized Bedrooms With Closets. The Tranquil Master Bedroom Has a Large Walk In Closet and 3 Piece Ensuite. Two Complete Renovated Washrooms & A New Glass Stand Shower (Master Bed). New Garage Door, New Concrete Porch And Side Walks. Extras: Include Fridge, Stove, Dishwasher, Build In Microwave, Washer, Dryer, Electric Light Fixtures. Property Is In A High Demanded Neighbourhood, Walking Distance Meadowvale Town Centre And Shopping Plaza, With A Variety Of Shops And Amenities; Schools and All Your Other Needs!